Washington, DC — In a startling public health reversal, the U.S. Environmental Protection Agency is now declaring that radiation exposures equivalent to as many as 5,000 chest x-rays “usually result in no harmful health effects,” according to an agency document posted today by Public Employees for Environmental Responsibility (PEER). For decades, EPA had taken the position that “There is no known safe amount of radiation” and is responsible for enforcing laws such as the Safe Drinking Water Act, which prohibits public radiation exposure at levels the agency now says is safe. “How much radiation is safe? How much is considered low risk? EPA’s longstanding scientific estimate is that 10,000 millirems would produce a risk at least 100 times higher than EPA’s acceptable risk range on radiation exposure to the public. EPA’s new approach is encapsulated in a policy with the paradoxical title of “Protective Action Guides” that allows public exposure to radioactivity following a nuclear release at levels many times the maximum limits of the Safe Drinking Water Act. It was finalized on the very last day of the Obama presidency but apparently has been embraced by the Trump team, as this health non-warning was issued just days ago. 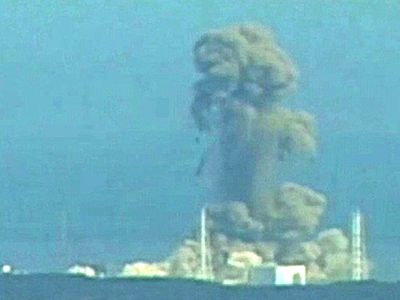 The greatest amounts of highly radioactive gases were released shortly after the meltdowns and 80% of this gas released by the reactors is believed to have traveled away from Japan over the Pacific. However the remaining 20% was dispersed over the Japanese mainland. 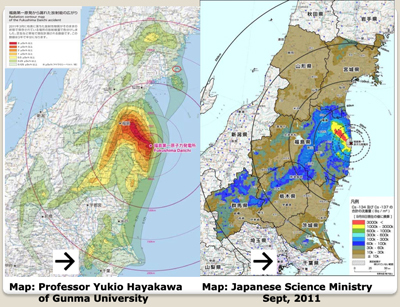 Eight months after the disaster, the Japanese Science Ministry released this map, which shows that 11,580 square miles, which is 30,000 square kilometers, which represents 13% of the Japanese mainland, had been contaminated with long-lived radioactive cesium. 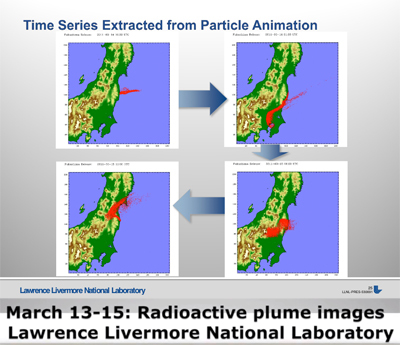 Note that the official map does not note any Cesium-137 contamination in the Tokyo metropolitan area, unlike an unofficial survey done at about the same time by Professor Yukio Hayakawa of Gunma University. 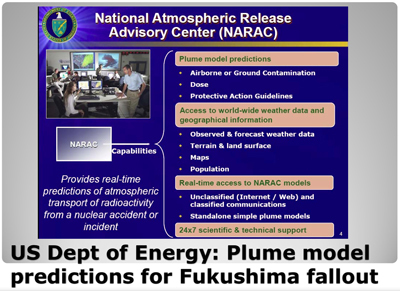 Given the fact that the Japanese government and TEPCO denied for two months that any meltdowns had occurred at Fukushima, one must look at all official data with a healthy degree of skepticism. 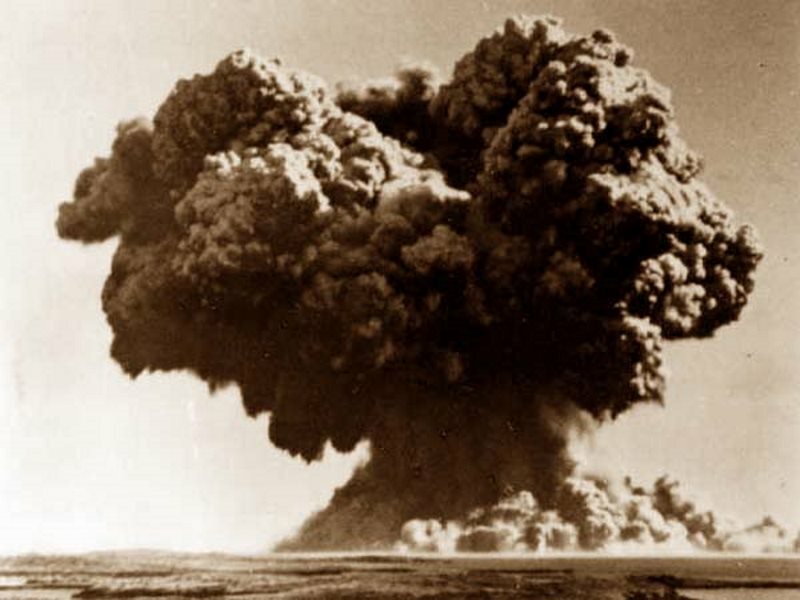 4500 square miles (or earlier today we heard 7700 square miles)—which is an area larger than the size of Connecticut—was found to have radiation levels that exceeded Japan’s previously allowable exposure rate of 1 millisievert per year. 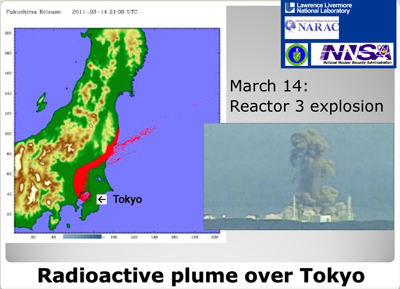 Rather than evacuate this area, Japan chose to raise its acceptable radiation-exposure rate by 20 times, from 1 millisievert to 20 millisieverts per year. However, approximately 300 square miles adjacent to the destroyed Fukushima reactors were so contaminated that they were declared uninhabitable. 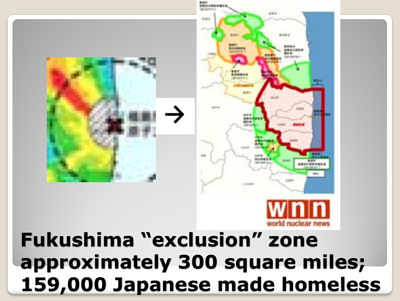 159,000 Japanese were evicted from this radioactive “exclusion zone.” They lost their homes, property, and businesses, and most have received only a small compensation to cover the costs of their living as evacuees. The vertical Y-axis is calibrated to the number of cancer cases per 100,000 age-peers, and the horizontal X-axis depicts the age of the population, beginning at zero years and moving towards old age. Now examine the allegedly safe dose of 20 millisieverts per year. As a result of this exposure, there will be about 1000 additional cases of cancer in female infants and 500 cases of cancer in infant boys per 100,000 in their age groups. There will be an additional 100 cases of cancer in 30 year old males per 100,000 in this age peer group. Notice that children, especially girls, are at the most risk from radiation-induced cancer. 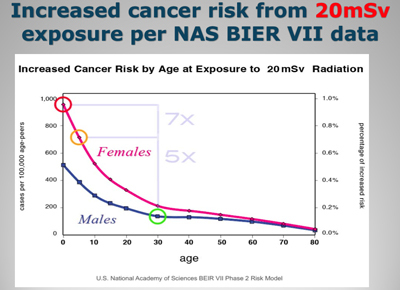 In fact a female infant has 7 times greater risk and a 5 year old girl has 5 times greater risk of getting a radiation-induced cancer than does a 30 year old man. I want to note here that there is a great deal of controversy in regards to the accuracy of the methods used to arrive at the millisievert measurement, especially in regard to an accurate determination of the biological effects of an external versus internal exposure to ionizing radiation. 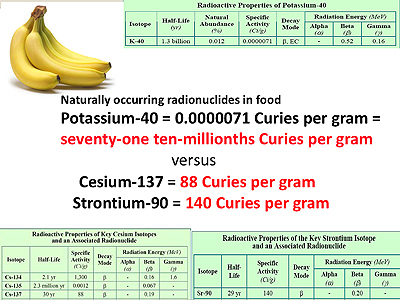 Cesium-137 also tends to biomagnify as it moves up the food chain. This means it becomes progressively more concentrated in predator species. 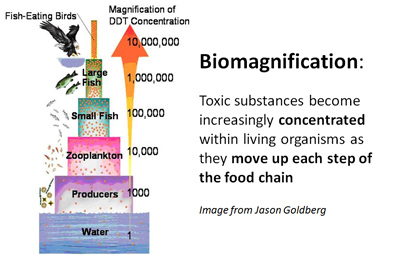 We have seen this before with other industrial toxins, such as DDT, which can magnify its concentration millions of times from the bottom to the top of a food chain. Consequently, all of the foodstuffs in a contaminated region tend to contain Cesium-137. Those naturally rich in potassium, such as mushrooms and berries, tend to have very high concentrations. Dairy products and meats also tend to have higher concentrations. 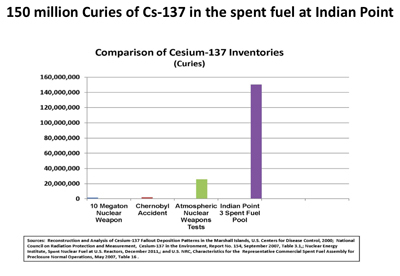 The International Commission on Radiological Protection, the ICRP, which sets radiation safety standards recognizes that Cesium-137 bioaccumulates in humans. 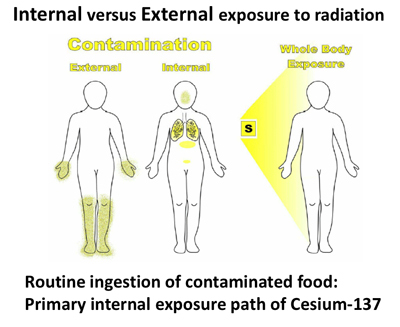 This ICRP figure compares a single ingestion of 1000 Becquerels of Cesium-137, a one-time exposure, with the daily ingestion of 10 Becquerels. On the single exposure notice that half the Cesium-137 is gone from the body in 110 days. 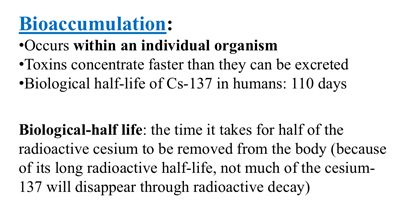 That’s considered the biological half-life. Note also that with the routine daily ingestion of 10 Becquerels of Cesium-137 the total radioactivity within the body continues to rise, until after about 500 days there are more than 1400 Becquerels of radioactivity measured in the body. 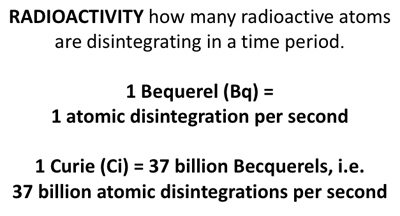 Becquerels can be counted in living persons because the decay of Cesium-137 leads to the emission of gamma radiation which passes through the body and can be measured by a Whole Body Counter. They have a chair that kids, or anyone, can sit and they can calculate the amount of Becquerels per kilogram of body weight. In a 70 kilogram adult (based on this), a total body activity of 1400 Becquerels would correspond to 20 Becquerels per kilogram of body weight. 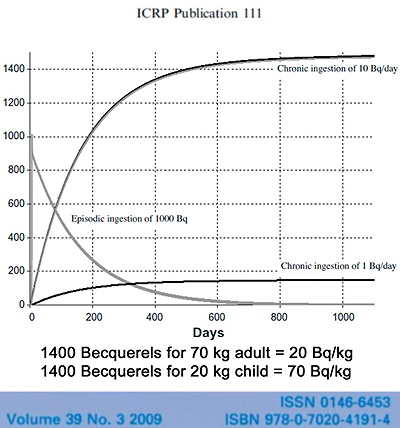 In a 20 kilogram child it would be 70 Becquerels per kilogram of body weight. The ICRP document does not specify the average age or weight of those examined in the study. However, the safety standards that have been set by the nuclear industry do not consider this level of chronic exposure to so-called “low-dose” radiation to be a significant danger to human health. 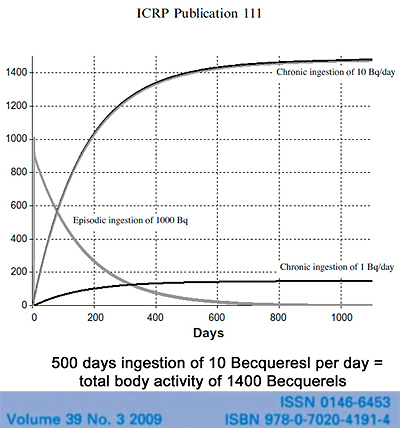 The ICRP states in this document that a whole body activity of 1400 Becquerels is equivalent to an exposure of one-tenth a millisievert per year. In other words, the radiation models used by radiation biologists that convert this level of internal absorbed dose to “effective dose,” do not predict serious health risks from such exposures. In fact they state that it is safe to have 10 times this exposure level. 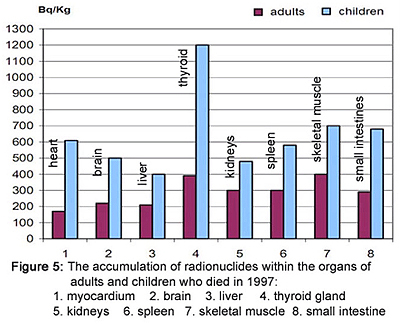 There is however strong evidence that the ingestion of these levels of so-called “low-dose” radiation are, in fact, particularly injurious to children. 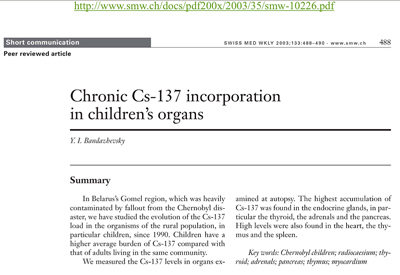 Research done by Dr. Yuri Bandazhevsky, and his colleagues and students, in Belarus during the period 1991 through 1999, correlated whole body radiation levels of 10 to 30 Becquerels per kilogram of whole body weight with abnormal heart rhythms and levels of 50 Becquerels per kilogram of body weight with irreversible damage to the tissues of the heart and other vital organs. 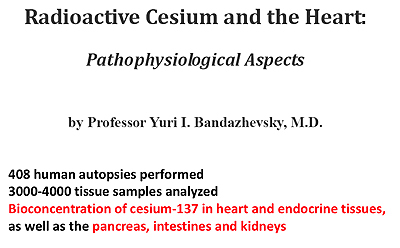 One of the key discoveries made by Bandazhevsky was that Cesium-137 bioconcentrates in the endocrine and heart tissues, as well as the pancreas, kidneys and intestines. 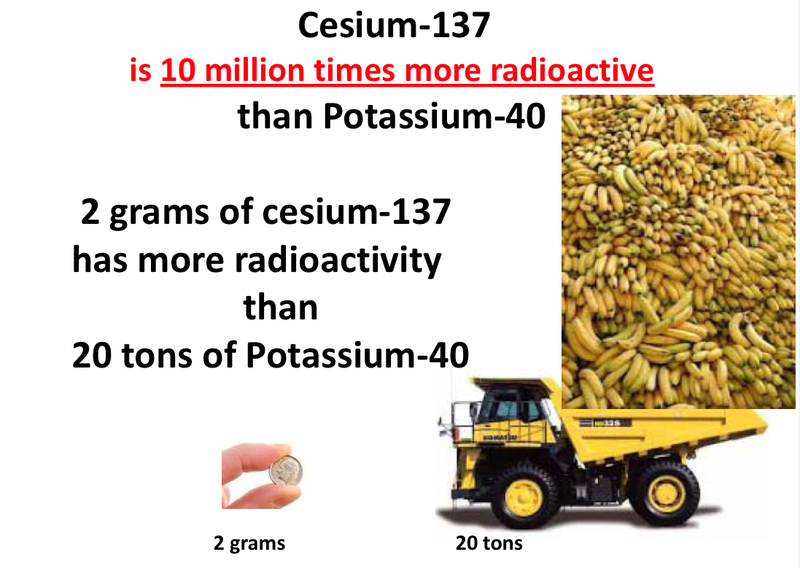 This goes completely against one of the primary assumptions used by the ICRP to calculate “effective dose” as measured by milliseiverts: that Cesium-137 is uniformly distributed in human tissues. Let me restate that. The current ICRP methodology is to assume that the absorbed dose is uniformly distributed in human tissues. This is, in fact, not the case. 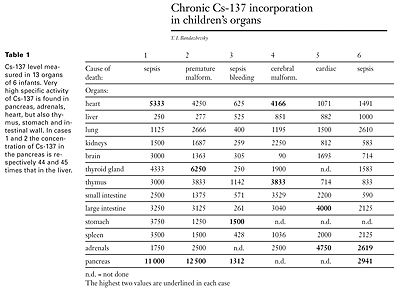 This table, taken from Bandazhevsky’s “Chronic Cs-137 incorporation in children’s organs,” compares the radioactivity measured in 13 organs of 6 infants. Very high specific activity, that is, levels of radioactivity, often 10 times higher than in other organs and tissues were found in the pancreas, thyroid, adrenal glands, heart, and intestinal walls. It was never previously translated in large part because shortly after Dr. Bandazhevsky presented it to the Parliament and the President of Belarus, he was summarily arrested and imprisoned. Government agents entered the Medical Institute which he directed and destroyed his archived slides and samples. After he was released from prison he was held under house arrest. It was during this time that he actually wrote the study. He did so in an attempt to preserve his research knowing that he was about to be imprisoned again for a very long time. 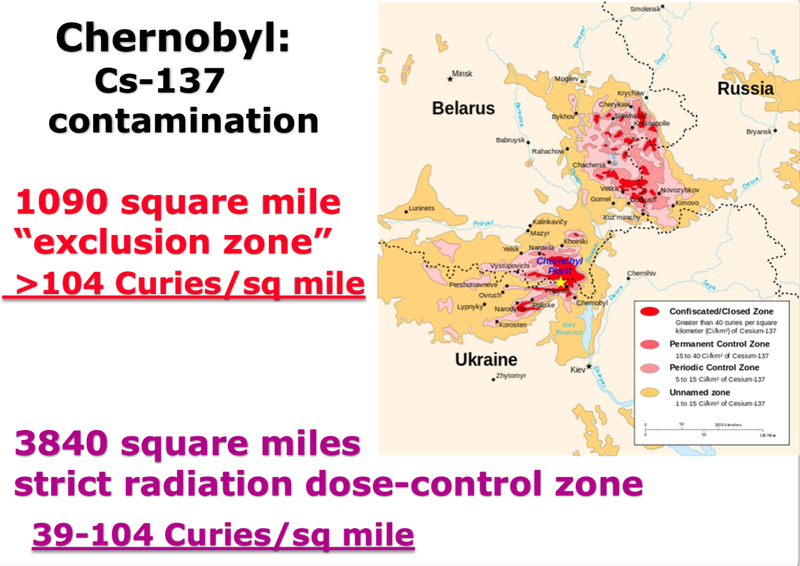 Just as Soviet physicians were forbidden to diagnose a radiation-related illness following Chernobyl, the Belarusian government acted to suppress the work of Bandazhevsky who had been protesting government efforts to resettle people back into land badly contaminated with Cesium-137. 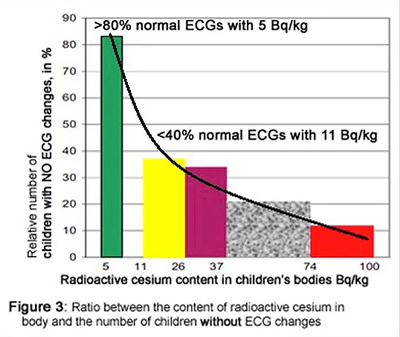 In “Radioactive Cesium and the Heart,” Bandazhevsky also did a correlation between the amount of Cesium-137 in live children and their heart function. 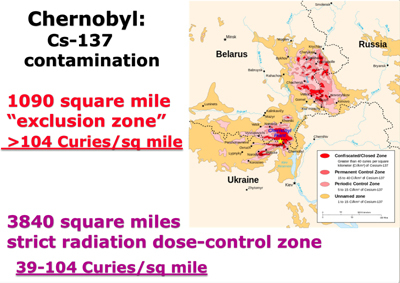 He worked with the BELRAD Institute, which conducted more than 100,000 Whole Body Counts on Belarusian children, measuring the amounts of internally ingested Cesium-137 in each child. 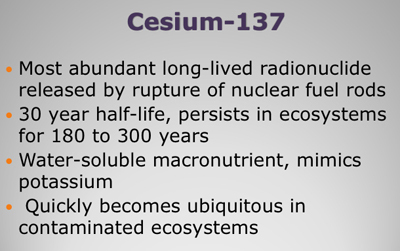 This slide, which shows the averaged results from hundreds of autopsies done during 1997, is also taken from “Radioactive Cesium and the Heart.” Notice the very high concentration of Cesium-137 in the thyroid gland. 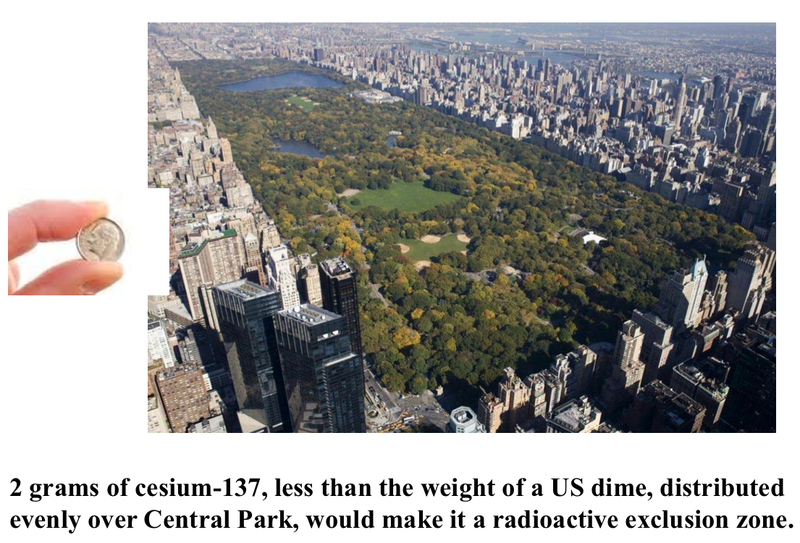 While we generally worry about radioactive iodine concentrating in the thyroid, Bandazhevsky’s work shows us that Cesium-137 is likely to play a major role in thyroid cancer too. 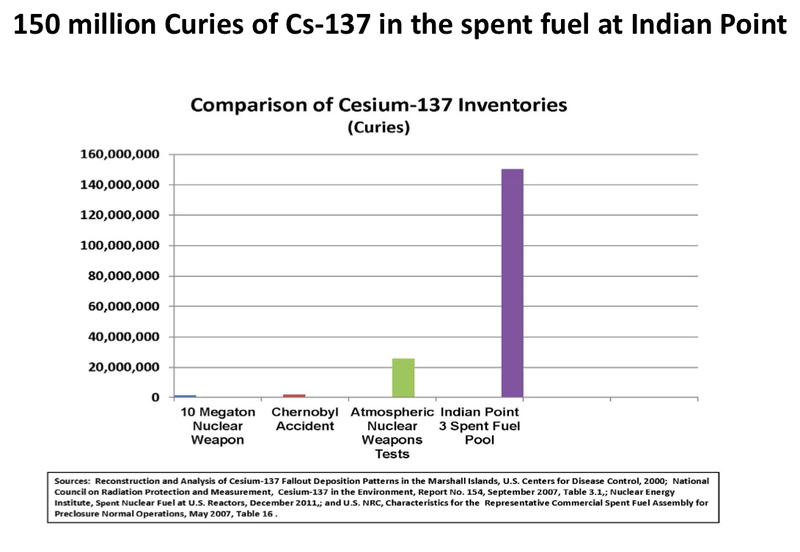 If Cesium-137 enters the body, it is distributed fairly uniformly throughout the body’s soft tissues, resulting in exposure of those tissues. 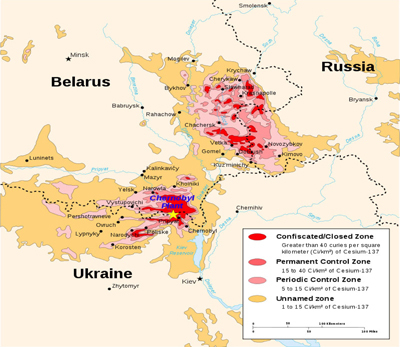 Two million people in Belarus live on lands severely contaminated by Cesium-137. Most of the children that live there are not considered to be healthy although they were before the nuclear power plant at Chernobyl exploded in 1986. 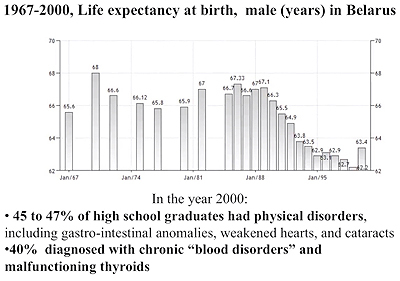 Fourteen years after the explosion, 45 to 47 percent of high school graduates had physical disorders, including gastro-intestinal anomalies, weakened hearts, and cataracts. And 40% were diagnosed with chronic “blood disorders” and malfunctioning thyroids. I am afraid that there are many Japanese people now living on lands equally contaminated with radioactive cesium. If Japanese children are allowed to routinely ingest foodstuffs contaminated with Cesium-137, they will likely develop the same health problems that we see now in the children and teenagers of Belarus and Ukraine. Thus it is very important that we recognize the danger posed to children by the routine ingestion of contaminated food with Cesium-137 where ever they might live. It is also important to prevent further nuclear disasters which release these fiendishly toxic poisons into the global ecosystems. 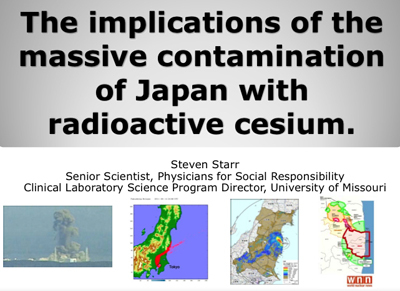 Given the immense amounts of long-lived radionuclides which exist at every nuclear power plant this is an urgent task. 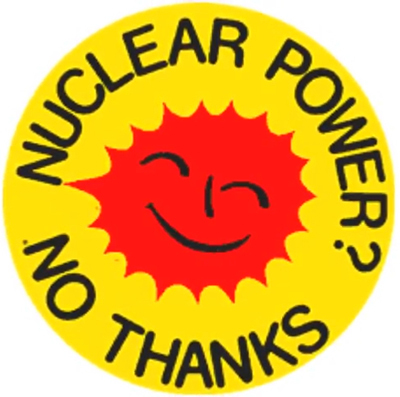 I hope I have made it clear that long-lived radionuclides produced by nuclear power plants are neither “safe” nor “clean.” I would suggest that it is very bad idea to manufacture these nuclear poisons to try to make electricity, that it is past time we stopped manufacturing them and try to manage those which we have already created which must be isolated from the ecosystems for at least 100,000 years. Steven Starr, MT (ASCP), graduated from the School of Health Professions at the University of Missouri, Columbia in 1985. He subsequently worked as a Medical Technologist over a period of 27 years at a number of hospitals in Columbia, Missouri, including Columbia Regional Hospital, Boone Hospital Center, and Ellis Fischel Cancer Center, as well as at Saint Mary’s Health Center, in Jefferson City, Missouri. Mr. Starr is currently the Director of the Clinical Laboratory Science Program at the University of Missouri. … [Interviewer] Yo: Every day the local government is measuring the radioactivity. All the television stations are saying that while radiation is rising, it is still not high enough to be a danger to health. They compare it to a stomach x-ray, or if it goes up, to a CT scan. What is the truth of the matter?